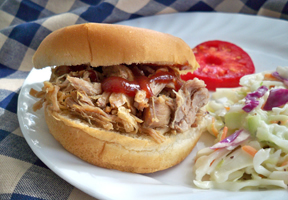 Easy to make slow cooker pulled pork sandwiches with a touch of barbecue flavor. This great tasting sandwich is perfect for tailgating, graduations, birthday parties, or any special gathering of friends and family. Heat the oil in 10" skillet over med-high heat. Brown the pork on all sides. Add the soup, ketchup, vinegar, and brown sugar to a 6 quart slow cooker and stir until mixed. Add the pork and turn to coat. Cover and cook on low for 6 to 8 hours, the pork should be fork tender. Remove the pork to a cutting board and let stand for 10 minutes. Using 2 forks, shred the pork. Remove any excess fat as you are shredding it. 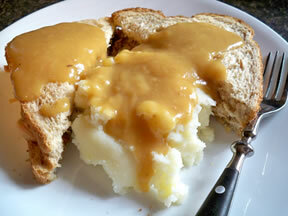 Pour sauce from the slow cooker and save. Return pork to the slow cooker. Pour some of the sauce back over the shredded pork. Add just enough to moisten pork well. Heat in slow cooker until meat is hot. If desired, stir in a little of your favorite barbecue sauce but just enough to add a little barbecue flavor. 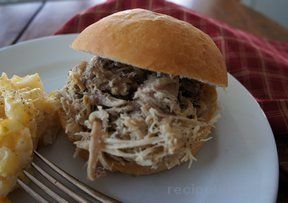 Serve the shredded pork on hamburger buns. 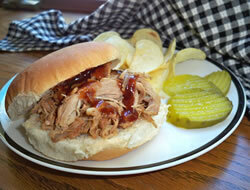 Note: The pulled pork can be prepared ahead of time and reheated when ready to serve. "I made these for a small Labor Day get-together we had and served them with the Ham and Veggie Macaroni Salad. They were great together. The sandwiches were so easy to make and everyone thought they were very good."